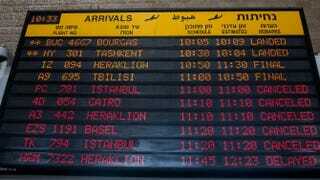 The arrivals-gate board shows canceled flights at Terminal 3 at Ben Gurion Airport on July 24, 2014, in Tel Aviv, Israel. Israeli officials detained two black American Jewish converts in a holding cell for nearly two days at Ben Gurion Airport before sending them back to the United States, the Jerusalem Post reports. Idit Malka, 40, and her 10-year-old son, Kahxin, of Cape Coral, Fla., said that they landed in Israel on June 12. Malka told airport officials that she planned to attend her sister’s wedding, visit five other siblings and return home on Aug. 20. But the officials had doubts. Israel’s Population, Immigration and Border Authority suspected that Malka intended to stay and join the Black Hebrew community, according to the Post. Ben Ammi Ben-Israel, the leader of the Black Hebrews, or African Hebrew Israelites of Jerusalem, died in December 2014. He was a metalworker from Chicago who said he had a divine vision in 1966 and led a group of African Americans to Israel in 1969. The Black Hebrews believe that they are descended from Jews who fled to West Africa nearly 2,000 years ago. The community in Israel has grown to about 3,000 members. According to the Israeli Ministry of Foreign Affairs website, the Chief Rabbinate of Israel declined to recognize the group as Jews when they arrived. The community’s status was in limbo for decades, until officials granted them permanent residency in 2003. But there’s an apparent fear of an influx of others wanting to join the group. The Post reports that Israeli officials carefully scrutinize African-American Jewish converts who enter the country. Malka told the Post that her family moved to Israel to join the Black Hebrew community when she was a child, but she returned to the U.S. at age 13 over ideological differences. She converted to Reform Judaism in 1995 and Conservative Judaism in 2004. A few years later, she immigrated to Israel but was denied Israeli citizenship. She returned, discouraged, to the U.S. in 2010. PIBA told the Post that it denied Malka entry to Israel last month because she failed to coordinate the visit with authorities, and she changed her story when questioned. Israeli officials also accused her of becoming violent and abusive during her detainment. Malka denied that she was violent but admitted to cursing at authorities after they mistreated her and used a racial slur. She and her son are now home in Cape Coral, disappointed that they didn't get to see their family and angered by the treatment they received. Read more at the Jerusalem Post.